My photos of Community Appreciation Day 2003, the 43nd. 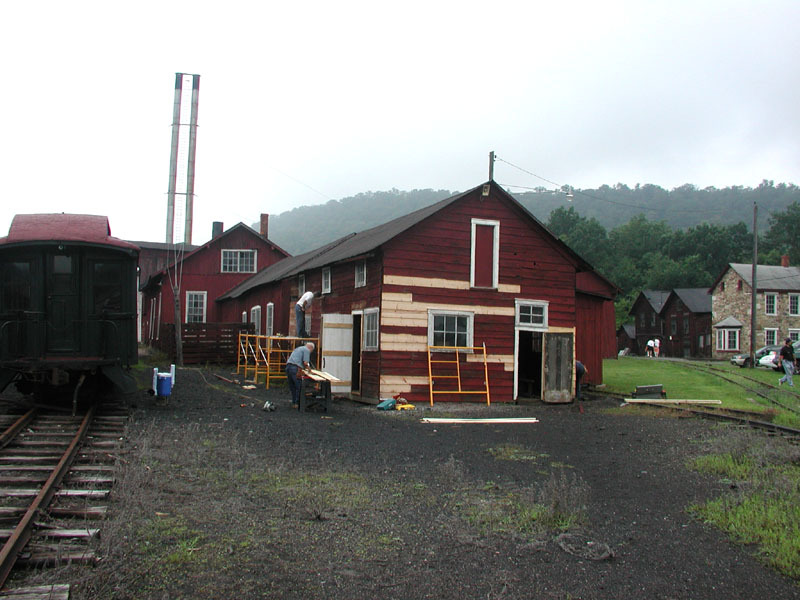 anniversary of the start of EBT tourist operations, including work by the FEBT restoration crew that weekend. .
Orbisonia Station and the Rockhill Roundhouse and shop buildings. The only sign of activity is the smoke and steam rising from the roundhouse chimney. Volunteers from the Friends of the East Broad Top begin work on the north end of the Electrical Shop building. 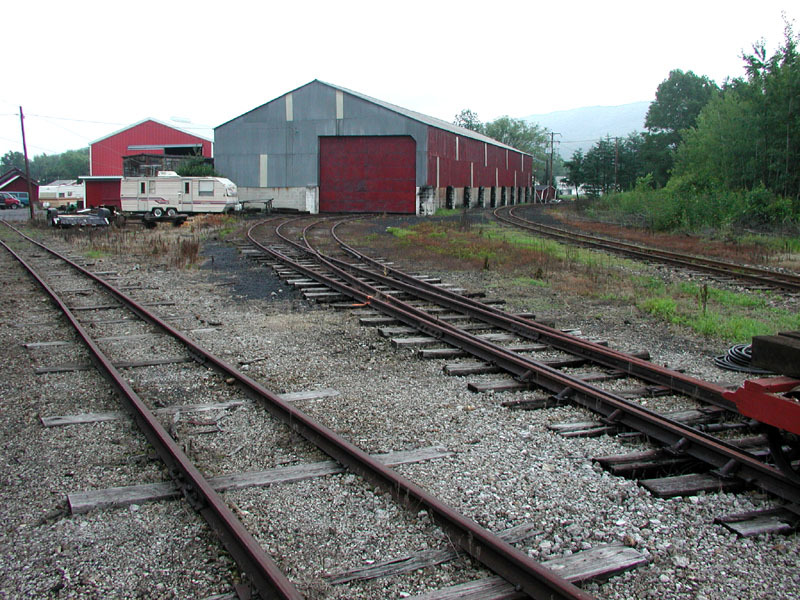 Meanwhile, another FEBT crew resumed rebuilding a passing siding through the yard. Rotted ties were dug out, replaced and respiked. Re-lay 7ft. 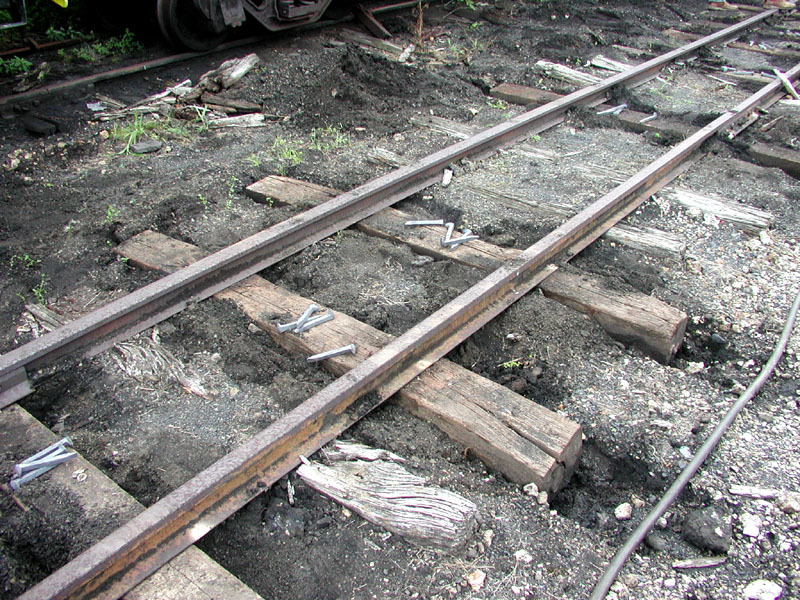 ties and new spikes with the original rails. We borrowed an air hammer from the Rockhill Trolley Museum. Here Reggie Alford drives some new spikes in. 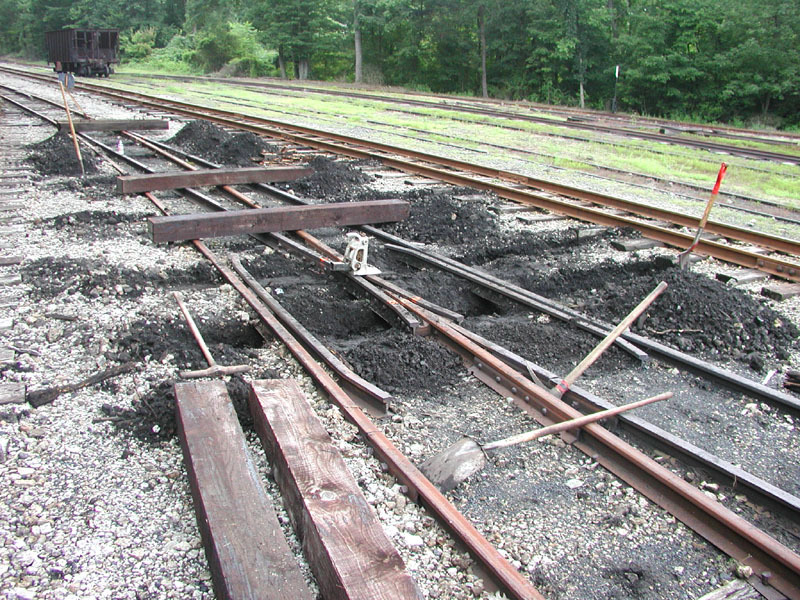 As I was busy working with the FEBT trackwork crew, I missed the dedication ceremony for the completed Rockhill Trolley Museum's new Black Log Narrows station. After a heavy rain Saturday night, on Sunday morning the active rail has a light sheen of new rust. Work continues on residing the Electrical Shop. That's FEBT Restoration Director and noted author Lee Rainey on ladder at right. 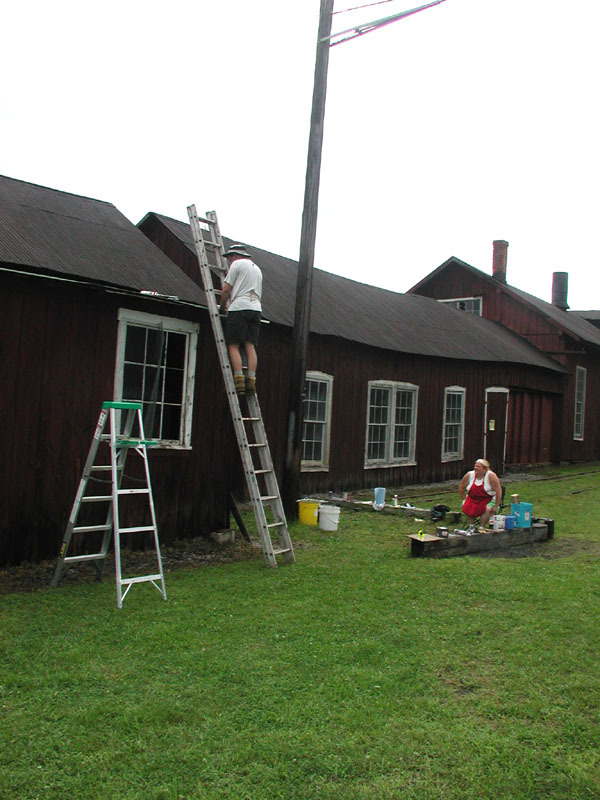 FEBT Webmaster Chris Coleman and his wife Pat at work repairing the Electrical Shop roof. 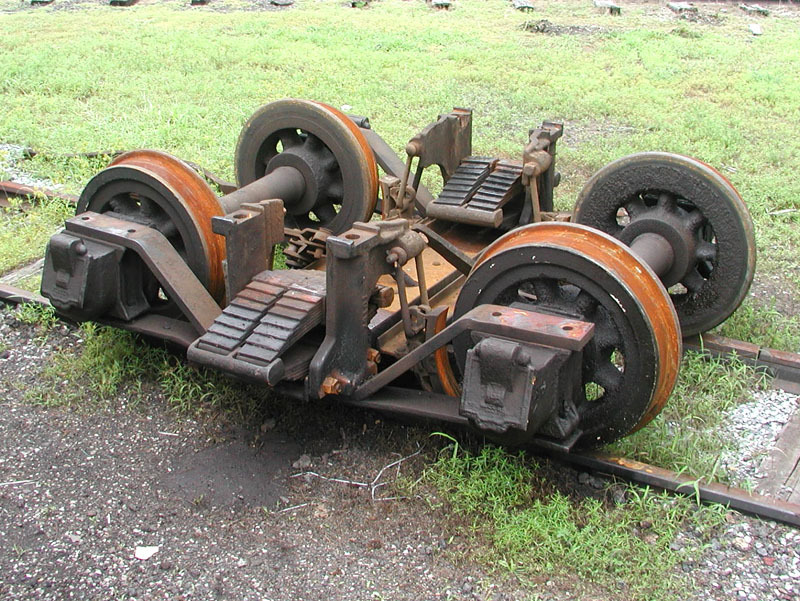 Loco #14's tender is undergoing some maintenance. 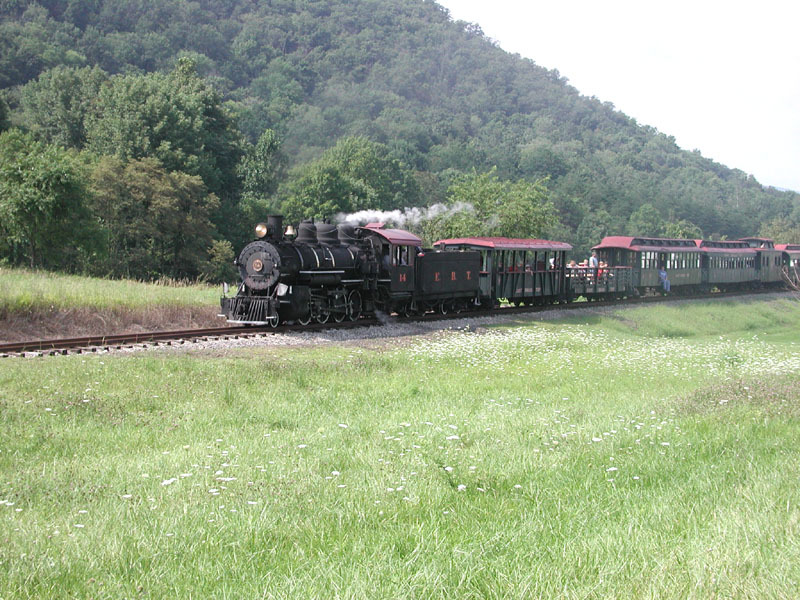 Meanwhile #14 is using the tender from #15 while hauling the passenger trains. Details of the archbar truck from #14's tender. It's not every day you get to see these truck details clearly. 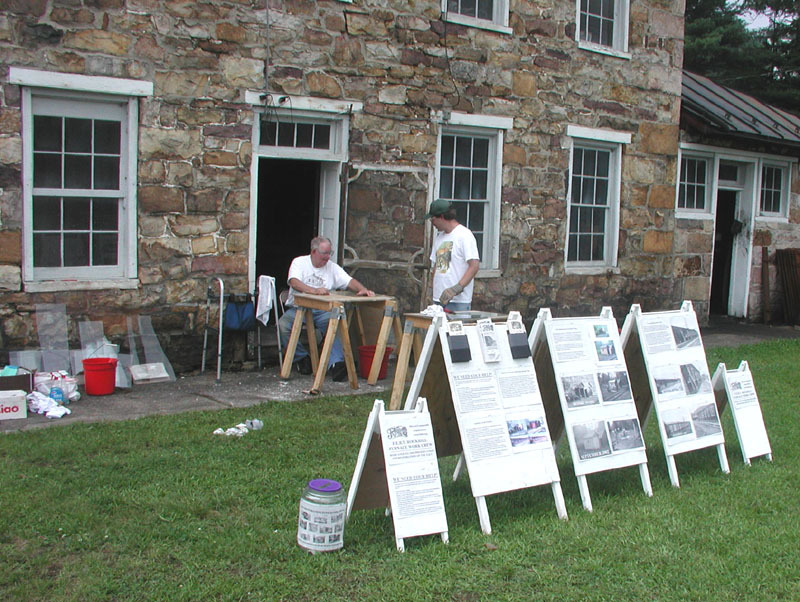 FEBT's display describing the restoration activities at the Store House building. 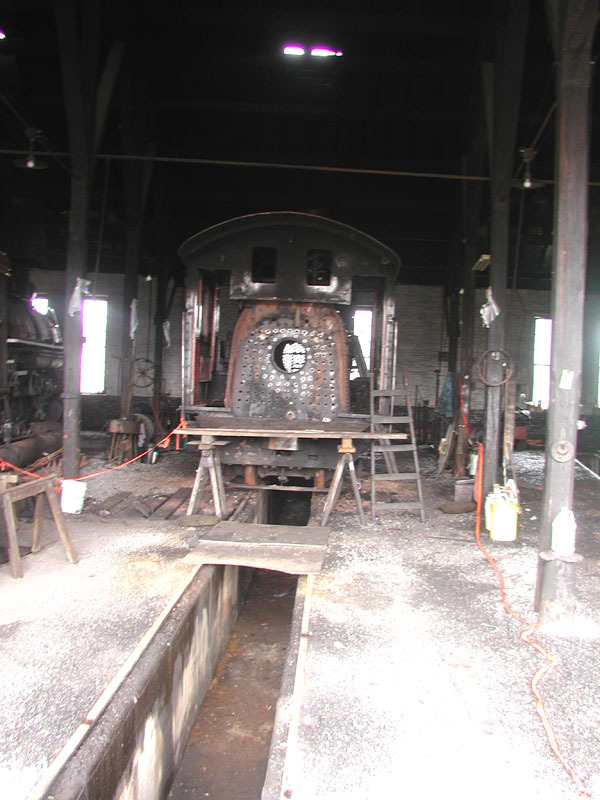 A peek inside the roundhouse shows current progress on the #15 rebuild. 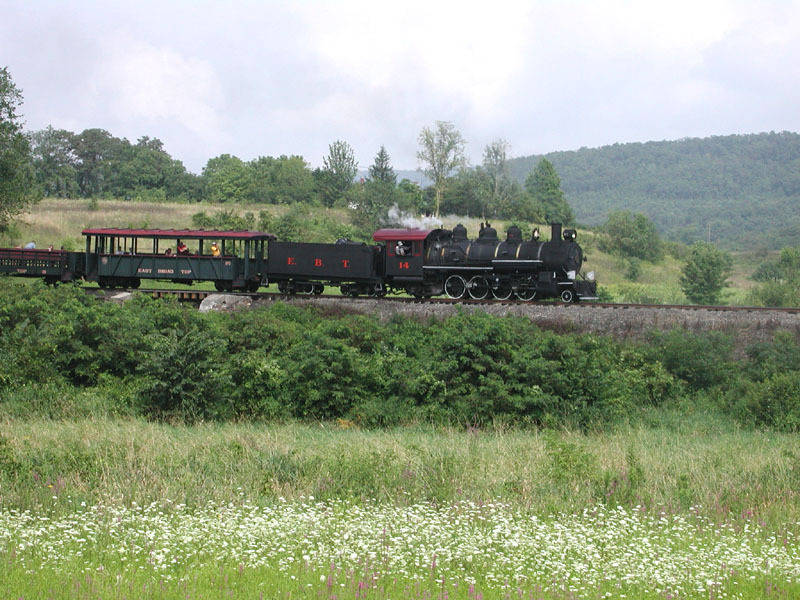 Sunday's first train returns to the Meadow St. crossing. 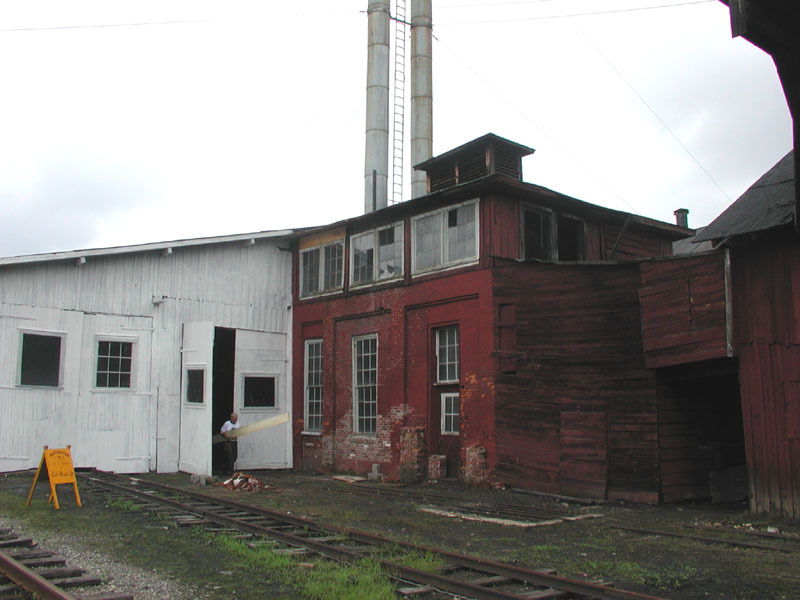 A view of the Boiler Room and Car Barn. Note the rebuilt brickwork at the Boiler Room wall. The end of the Car Barn has a coat of white primer. 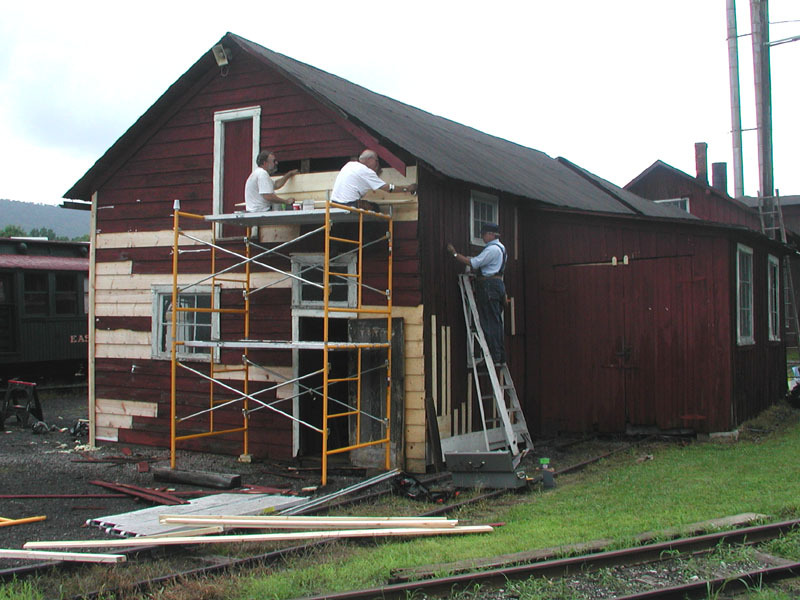 Due to threatening rain, we were unable to paint the Car Barn as planned. 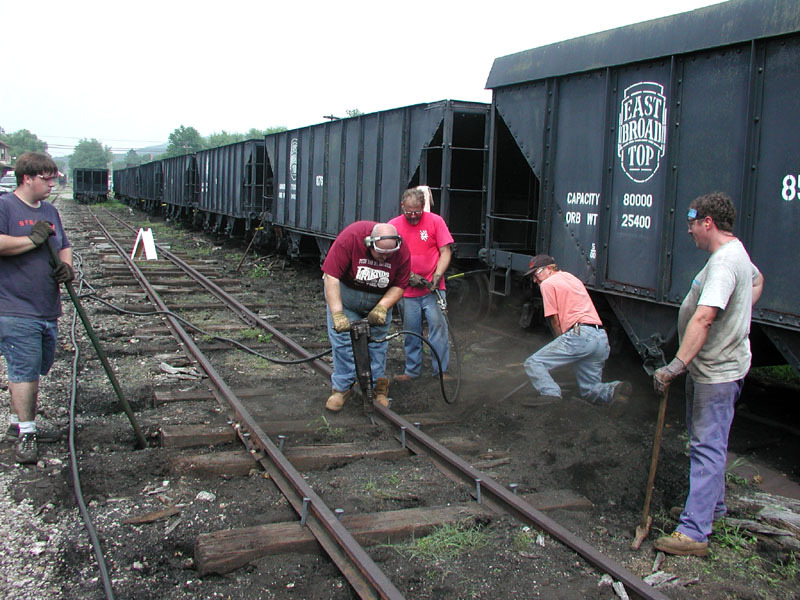 The track repair crew pause for the first Sunday train. The original tie was rotted and had to be dug out in chunks. 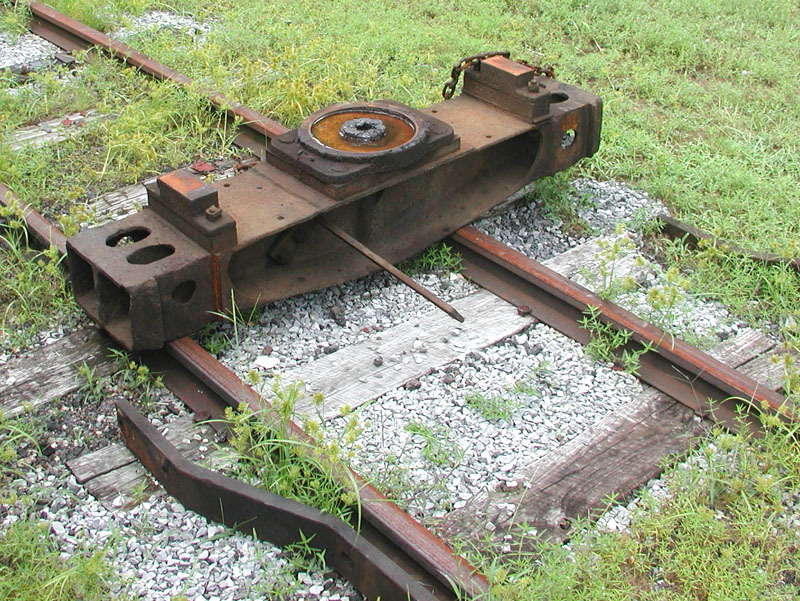 The replacement tie is now ready to be installed. 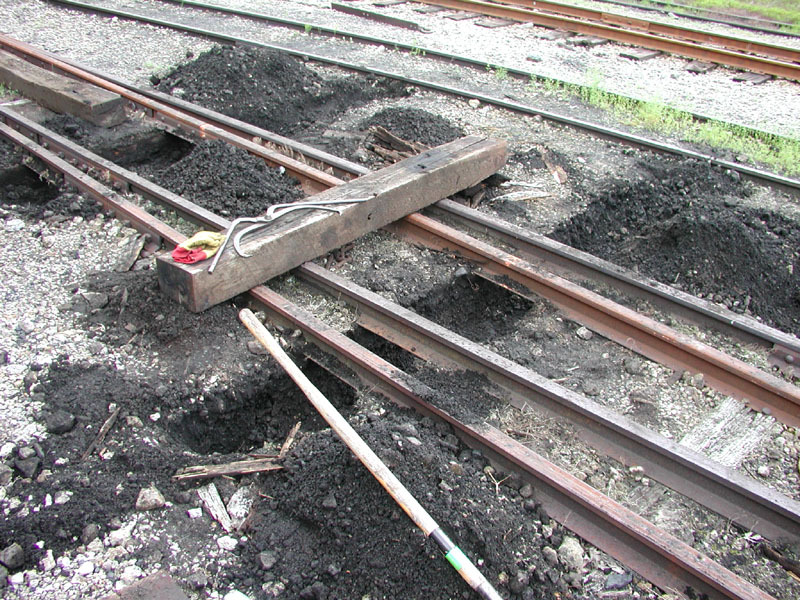 Several ties underneath the south switch of the passing siding had to be replaced. 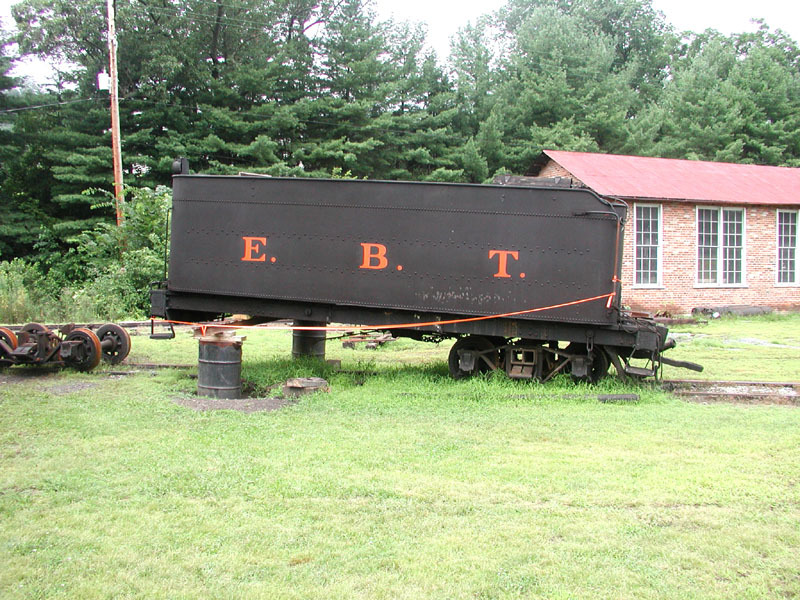 This EBT handcar was used to move replacement ties to where they were needed. 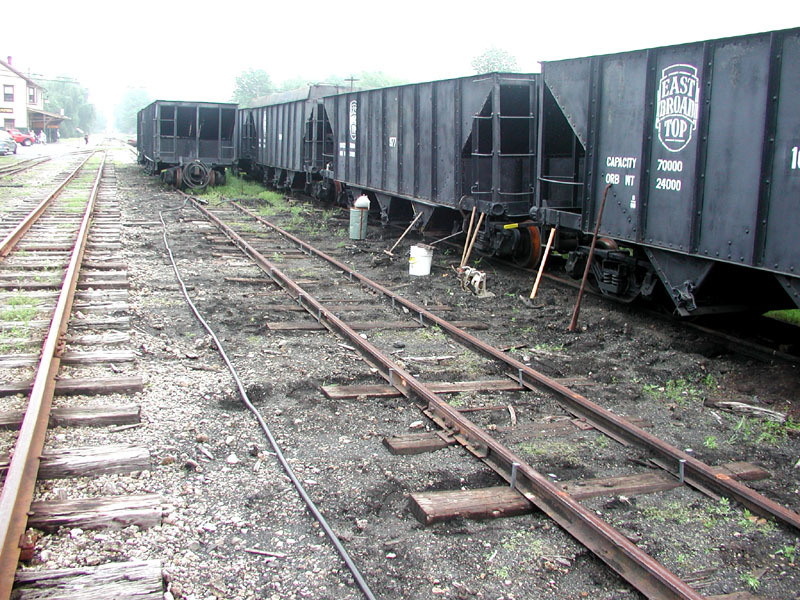 Improvements to the lead into the Trolley Barn will permit a tuneup for EBT's M-1 for the 2003 Fall Spectacular. 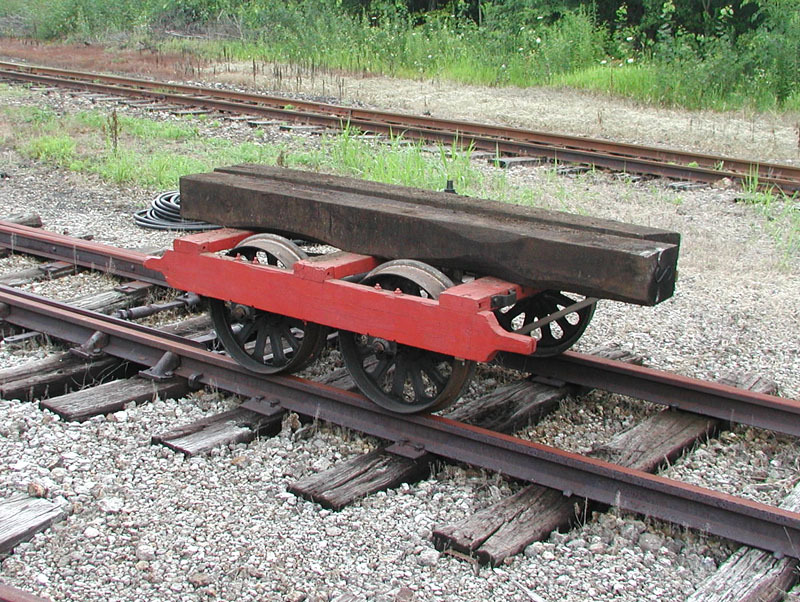 The M-1 weighs 46 tons. 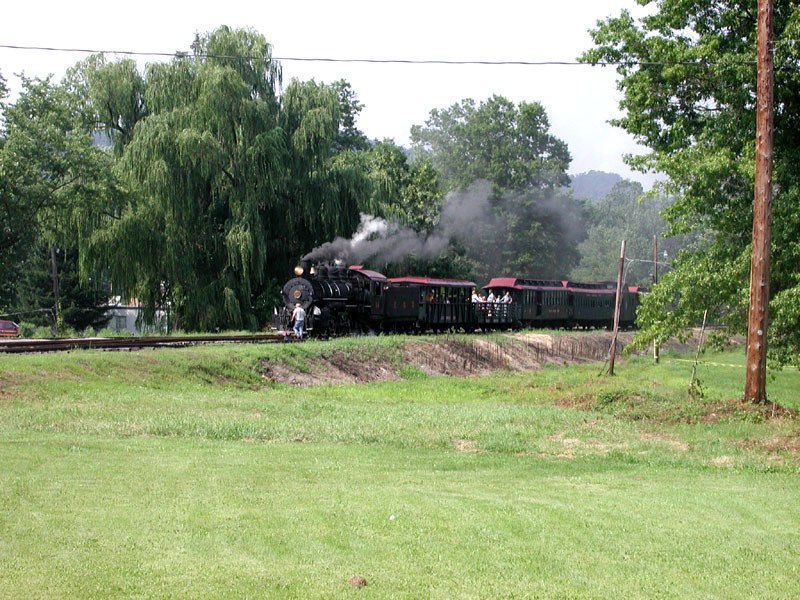 Sunday's last train crosses the Runk Rd. bridge on its way back to Rockhill. 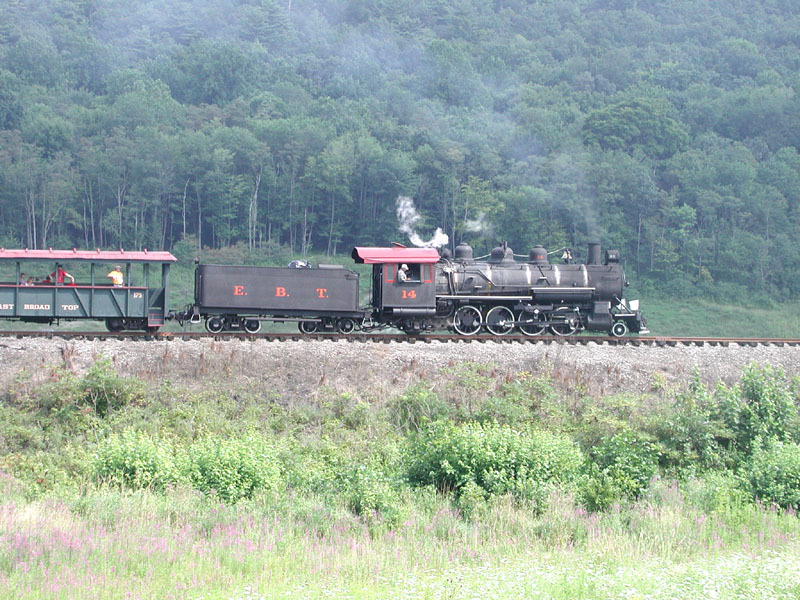 #14 (with #15's tender) southbound across the long fill. Working uphill towards McMullins Summit. 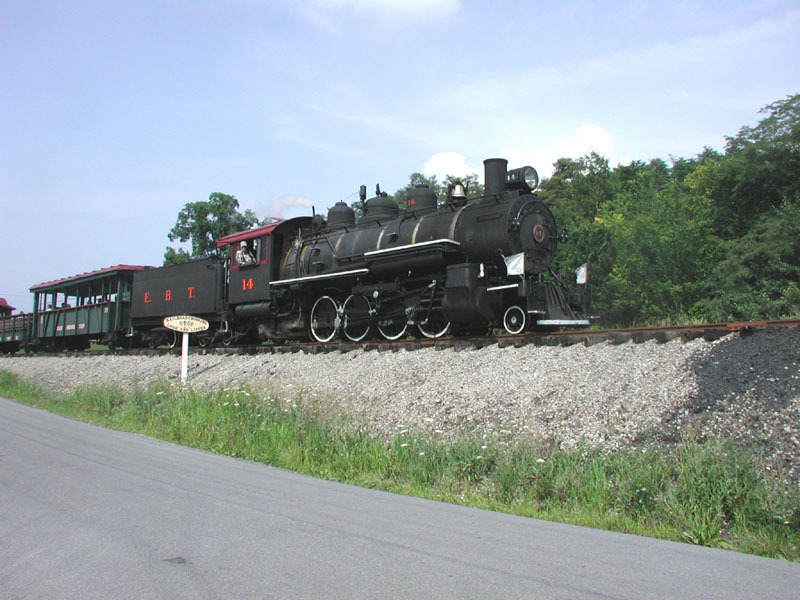 Just past the Enyart Road grade crossing. 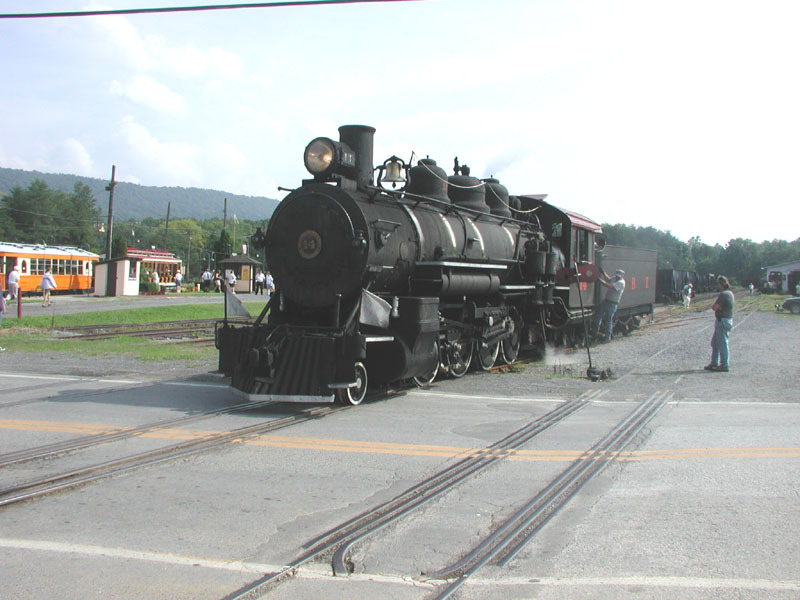 Just after crossing the Rockhill Furnace bridge, the train approaches the station area. 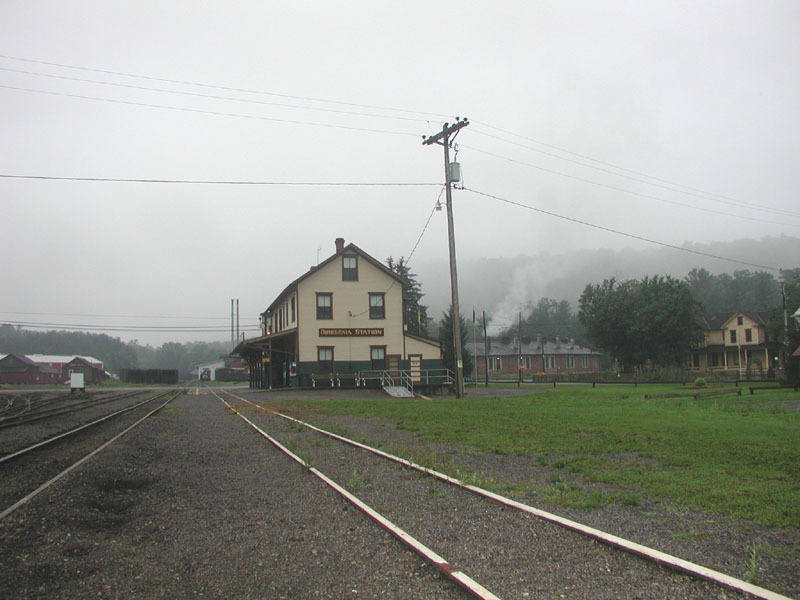 After turning on the wye, the train approaches Orbisonia Station. 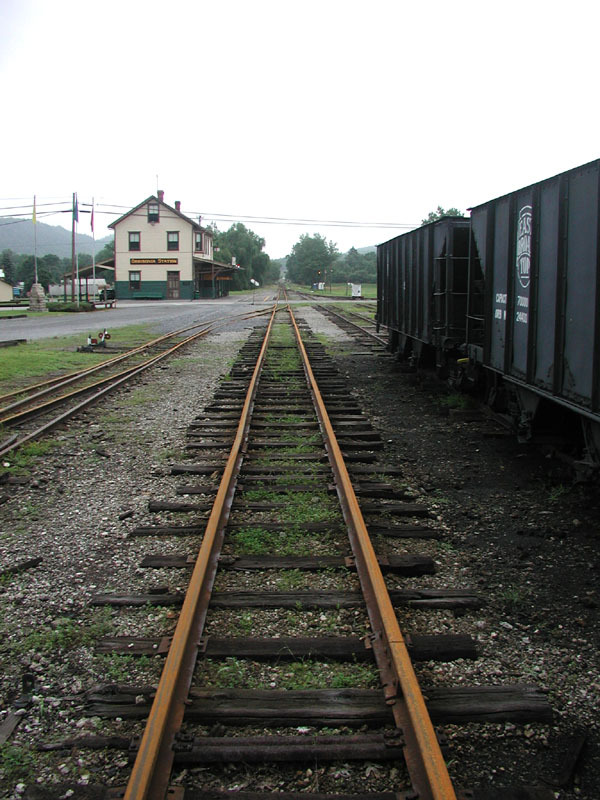 The train begins to unload. 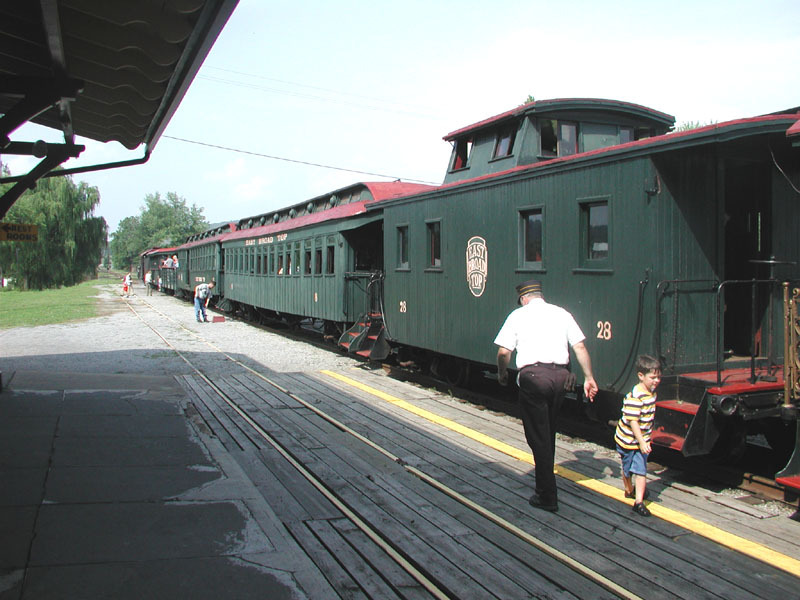 Looks like that kid enjoyed his caboose ride! 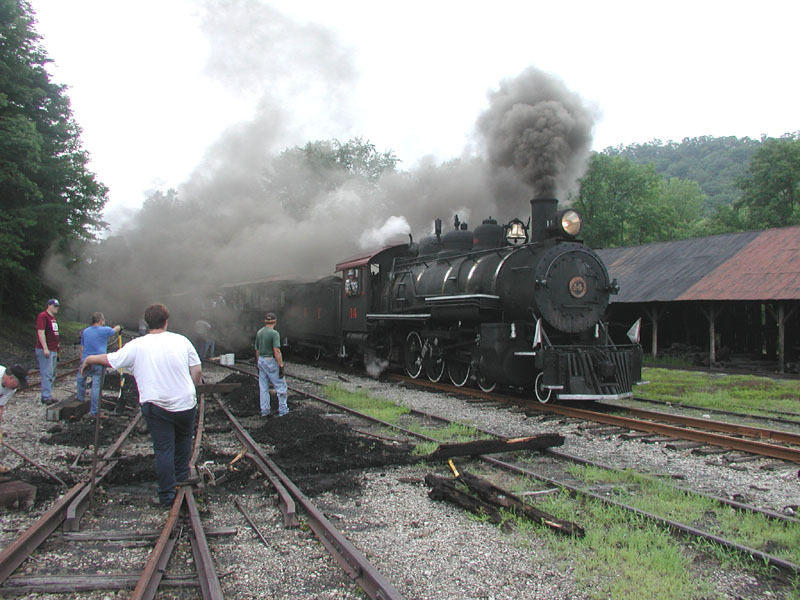 #14 backs up the passenger train onto the storage siding. 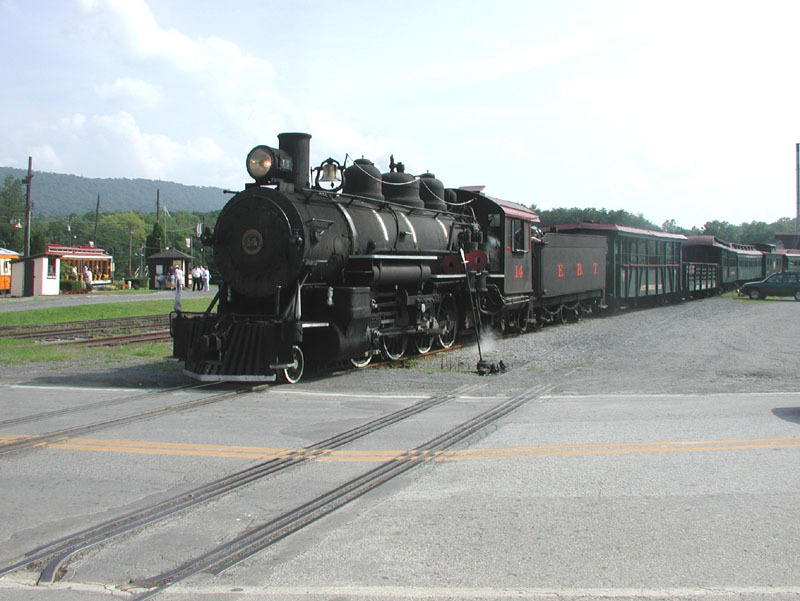 #14 pulls forward after uncoupling from the train, to return to the roundhouse. After leaving Rockhill, I stopped at Black Log Narrows to view the Rt. 522 road construction. 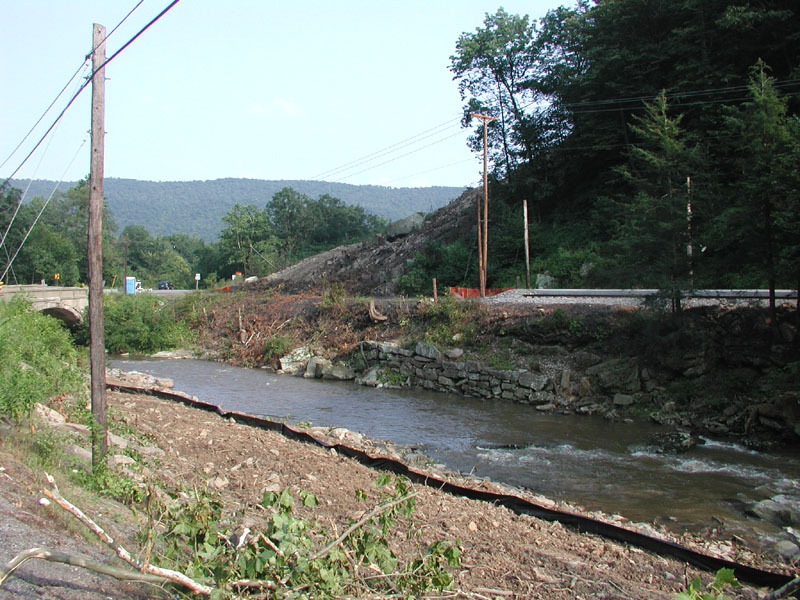 At this point, trees have been cleared in both directions from the old highway bridge. 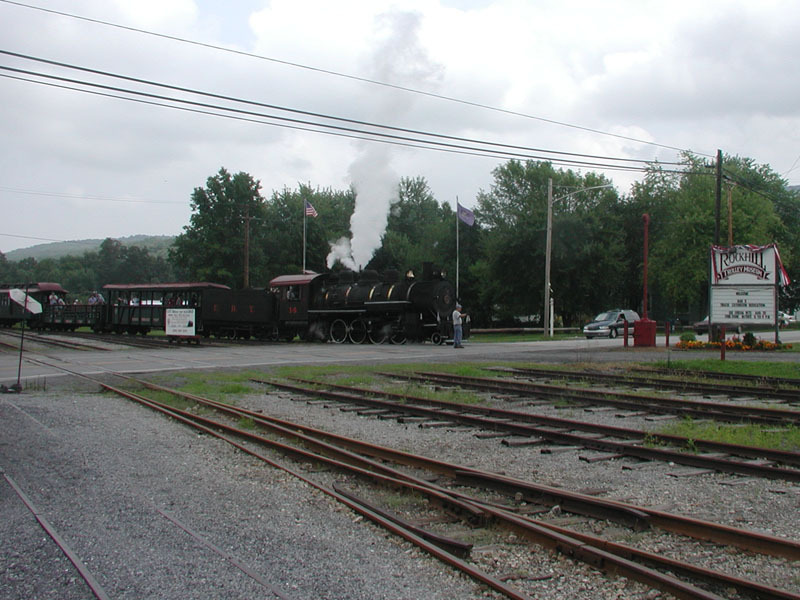 A southbound view of the old bridge and trolley platform. It looks like the highway will be realigned to the right, and the hillside will be cut back. 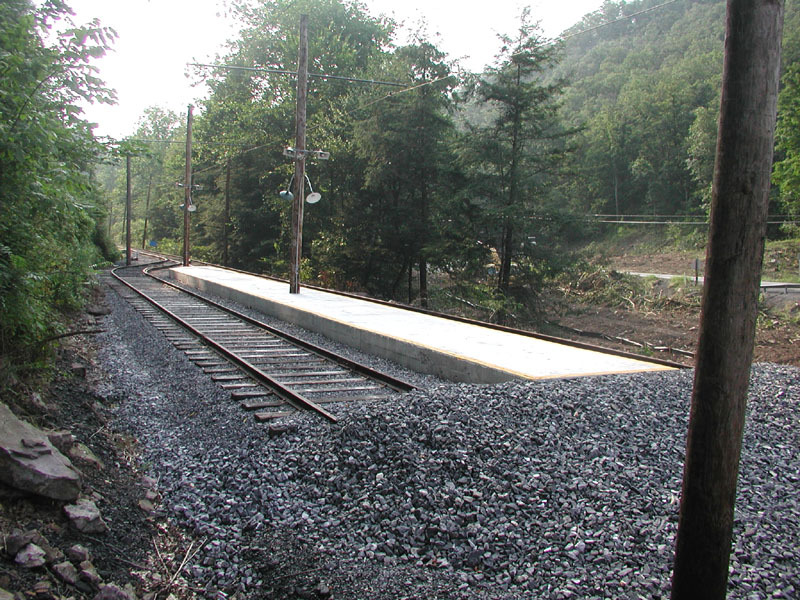 The newly completed Black Log Narrows trolley platform. The old Rt. 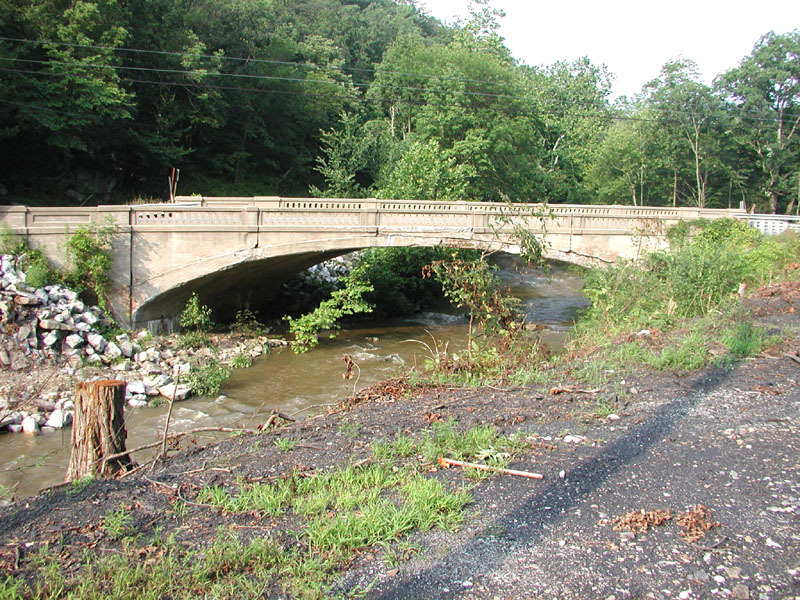 522 highway bridge, soon to be replaced. All photos taken Saturday and Sunday, August 9th. and 10th., 2003 by James A. Vliet. All photographs are copyright (c) 2003 by James A. Vliet. All Rights Reserved.